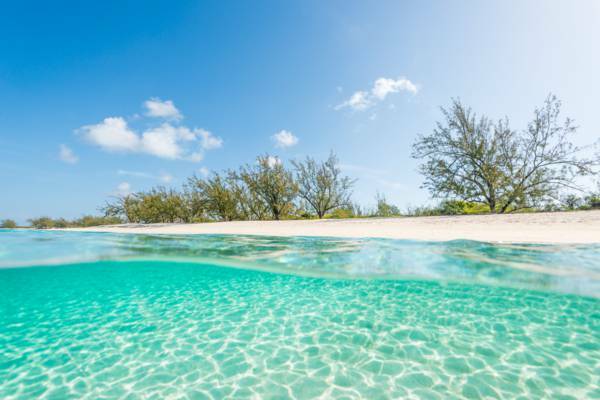 If you want to get away from the Cruise Center and see a bit of Grand Turk without renting your own vehicle, a basic open air island tour will be your cheapest option. Although a private taxi tour will cost more, the experience is almost always better. Keep in mind that renting your own vehicle and exploring on your own is in the same relative price range as a tour. A typical open-air tour truck. This page refers to land tours driven by a guide. 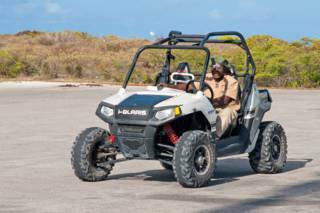 If you’re interested in an excursion where you can drive your own machine, see ATV Tours, Dune Buggy Tours, and Segway Tours. For boat tours and charters, see Grand Turk Boat Cruises. Due to the relatively low cost (compared to other activities) and general accessibility, guided island tours are the most popular shore excursion activity for cruise ship guests stopping over on Grand Turk. Organized and scheduled tours are offered through the cruise lines, but it’s also possible to simply sign up at the Grand Turk Cruise Center. A private tour by taxi can easily be arranged at the taxi queue at the Cruise Center as well. 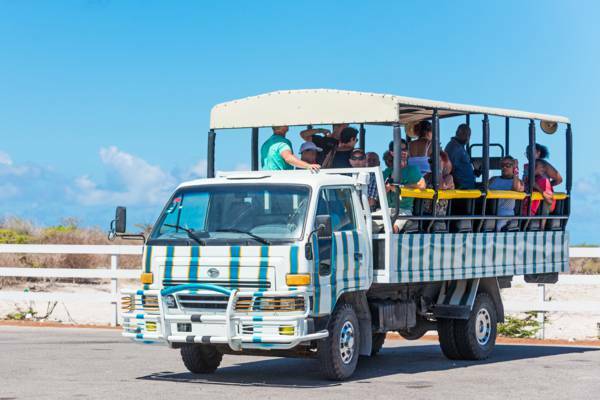 The organized tours tend to use two different types of vehicles: small air-conditioned buses, and converted flatbed trucks with open-air seating. Narration on the sights by a guide is also provided. Scheduled tours are typically 2-3 hours in duration. The excursions begin at the Grand Turk Cruise Center. The initial stop is typically Governor's Beach, after which the tour continues on to the old oceanfront section of Cockburn Town, where you’ll pass the Cockburn Town Beach, Her Majesty's Prison, St Mary's Anglican Church, and the Turks and Caicos National Museum. 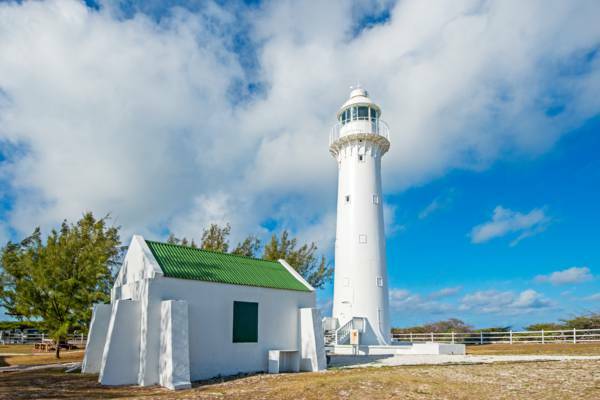 Found at the northern point of the island, The Grand Turk Lighthouse is another stop and a great place explore a bit. 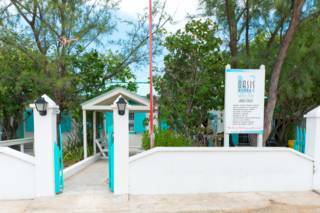 The grounds are interesting, the views over the ocean from the adjacent cliffs are spectacular, and you’ll be able to look over the nearby and deserted Grand Turk's U.S. Navy NAVFAC 104 Base. On the return journey, the interior roads near Town Pond and The Red Salina are followed, so you’ll be able to see remnants of the abandoned salt industry. Tours also often stop at the exhibits and shop of the The Salt House. Humpback whale watching is a popular seasonal activity, but time constraints of shore time may make this difficult for some of the short cruise stops. Visiting Gibbs Cay, a stingray encounter where the rays freely ineract with people, is also a popular shore excursion for cruise guests. You can snorkel with the rays and feed them, if you wish. These tours are typically combined with a snorkelling cruise where you can see the coral reefs on Grand Turk's southern coast. Take an Island Tour… Or Explore on Your Own? What’s the best way to spend your cruise ship visit? We believe that Grand Turk offers something that’s actually uncommon in the Caribbean – a small interesting island that’s both easy and safe to explore on your own. Most cruise ship visits allow for about 5-6 hours of time that can be spent on activities and attractions. Due to buffer times before and after a cruise ship lands, and the time required for everyone to gather for shore excursions, most organized activities and tours have 2-3 hour durations. You’ll often simply have more time to see the sights and relax on the beach if you rent a car and explore on your own. You’ll have the best tour experience if you bring the right items, and not carry things that you don’t need. The sun at Grand Turk is typically intense, which is perfect for the beach yet not so great when exploring on land. To avoid sunburn, we advise bringing long sleeves and plenty of sun screen. If you’ll be going in the ocean, please use a reef safe variety. A wide-brimmed hat and polarized sunglasses are also recommended. Polarized lenses cut down on water reflections, which better allows you to enjoy our turquoise water, reefs and marine life. It also makes sense to bring drinking water. Water and drinks can be found across the island and may be provided by tours, yet if you have a reusable bottle, please use it. Grand Turk generally doesn’t have an issues with mosquitoes, yet some coasts may have biting midges (no see ums). It makes sense to bring insect repellent if you’ll be exploring remote coasts or beachcombing. A camera is of course a popular tourism accessory. If you’re purchasing or have a choice, we advise going with a compact waterproof type. If you’re a bit more serious about photography, see Landscape and Nature Photography, and Underwater Photography. Many of the smaller businesses on Grand Turk only accept cash (we use the U.S Dollar). There shouldn’t be any major tour expenses after initial booking, yet there may be souvenir, drink and snack purchases. There are ATMs at the cruise centre and at banks in Cockburn Town. See the best of Grand Turk on Mama Dea's Island Taxi Tour. Experience old Cockburn Town, the salinas, Front Street, North Creek and the Grand Turk Lighthouse on Oasis Diver’s Coast to Coast island Tour. Get a clear view of the sights from our open-air trucks. 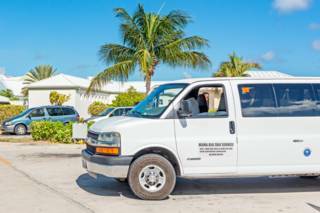 Informative taxi and island tours on Grand Turk by long-time local resident Patsy Taylor. Last reviewed by an editor on 28 August 2017.